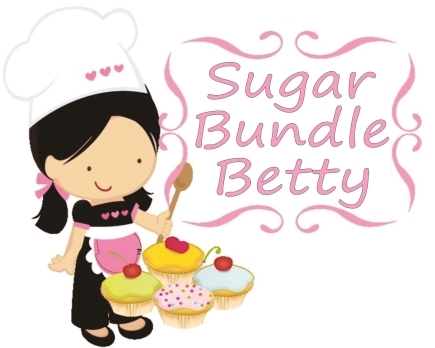 ← Chocolate Peanut Butter Cream Cupcakes…..
Bacon, cheese and green onion scones………………………..
A lot of folks wrinkle their nose when they hear the word SCONE. They think DRY, CRUMBLY…..kinda like the ones in a popular coffee shop who used to have really good scones, but then all of a sudden made them smaller and more dry. BLEKH. If you have never had a scone, think of a good biscuit. A flaky, tender, buttermilk biscuit. 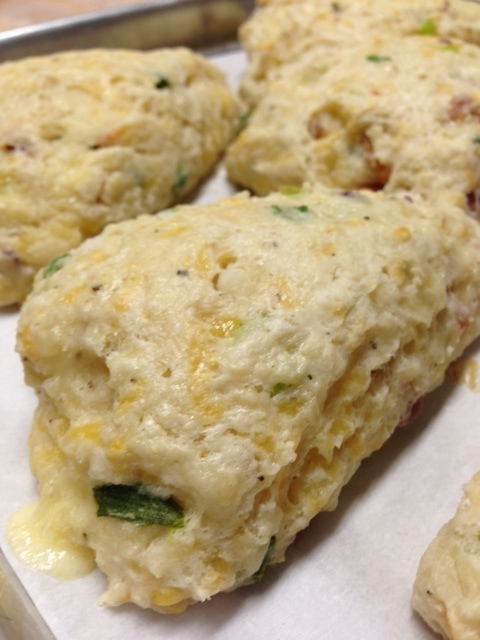 A scone is similar but it usually has stuff in it….like fruit. Usually scones are sweet. I love those. I have posted a couple of those kind. But I also like savory scones. 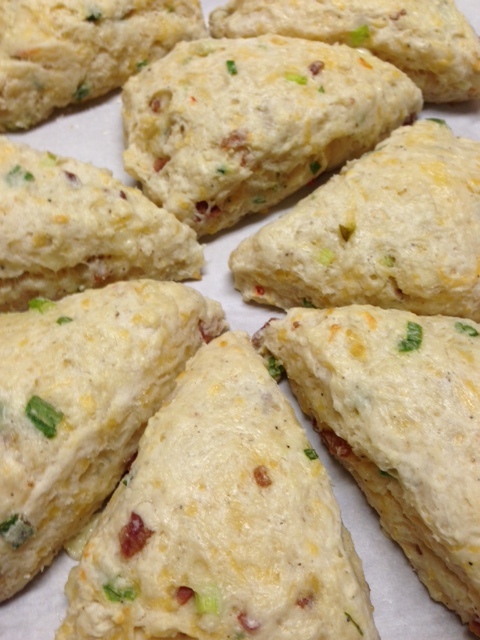 These are loaded with bacon (which you do not have to add), cheese, green onions, jalapenos and lots of black pepper. They are best, slightly warm, with or without butter. It’s the perfect “something” to serve guests. You could pretend you have this wonderful Bed and Breakfast Inn, that people all over the world want to visit, just to have one of your scones! Does that sound wonderful or what! You can leave out the bacon. You can add so many things to this recipe. I hope you enjoy it. Note: the reason they are so light in color, is because I used mostly Jack cheese, which is light in color. I also slightly underbake to avoid them being too dry and making you hack and cough. Then you would complain that my scones are dry, like that popular coffee place and we can’t have that. OMG! These sound sooooo good! Will have to give these bad boys a try! You are ripping it up! Good going!